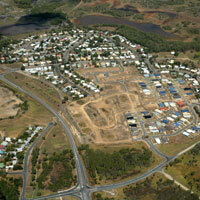 Mackay's Northern Beaches include the suburbs of Bucasia and Shoal Point. Although they were once merely holiday destinations, these days they're popular residential suburbs where young families make the most of coastal living. Bucasia is located just a little north of Eimeo, at the start of a peninsula that ends at Shoal Point. Its long, sandy beach has a northerly aspect, which provides it with protection from winds and makes it one of the City's most frequented beaches. Views take in Dolphin Heads and the northernmost Cumberland Islands and the shoreline stretches for kilometres in a ribbon of gold. The suburb has an interesting mix of established homes and new developments. A great many are low-set, brick and tile or rendered, but there are also some that are high-set and constructed of weatherboard. It's still possible to find a few of the older, fibro holiday homes, which are likely to be replaced by flash new beachside dwellings.